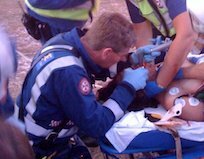 Is there more to meets the eye to pre-hospital intubation than just a tube? In a recent review of the literature about pre-hospital intubation in traumatic brain injury (TBI) and the potential impact of hyperventilation, Gaither et al. explore the potential confounders for outcomes in previous studies. The authors provide a nice overview about the “old school” rationale for hyperventilation in TBI and why it is unlikely a good idea! Why hyperventilation thought to be beneficial in TBI: 1) decreases arterial PaCO2 with CNS vasoconstriction 2) decreased cerebral blood flow. Net result is improved cerebral perfusion pressure (CPP). However, hyperventilation after intubation may increase intrathoracic pressure, increase JVP and subsequently decrease CPP. Hypocarbia may also lead to free radical formation and cellular damage. So net result is PaCO2 of 25 isn’t a good idea! Probably best to target into something like 35. The authors then outline the historical concerns about pre-hospital intubation (low success rates, long scene times and complications like hypoxia). However, they argue that perhaps its not the intubation itself that may confound these “worse” outcomes, but perhaps the greater potential for hyperventilation! And the detrimental effects may in fact occur post-intubation. A nice conclusion is provide (which I fits well within the general tone of the article). This article makes a great case for well trained medical personnel who perform pre-hospital intubations and then provide the best post-intubation care possible. This entry was posted in Procedures and tagged airway, RSI, TBI by petro82. Bookmark the permalink.